Carrillo Plaza is located at 210 W. Carrillo Blvd. and was sold by Carrillo Holdings, a Santa Barbara-based real estate company. It has shed six Santa Barbara properties over the last 18 months. Thanks to a four-year renovation, new tenants and a Starbucks coffee anchor, owners of a downtown Santa Barbara property were able to flip the Carrillo Street asset for $12.2 million. The buyer was New Group-Santa Barbara, a Los Angeles-based business entity. operties over the last 18 months. 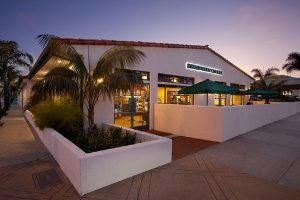 The nearly 19,000-square-foot Carrillo property was completely renovated over the last four years and is the new home of Tino’s Italian Grocery, which has moved from its longtime De La Guerra Street location. Savills Studley Executive Vice President Bill Bauman and Corporate Managing Director Kyle Miller, represented the seller in the transaction. The Carrillo Plaza sale is the latest trasaction in a series of sell-offs for Carrillo Holdings. The company is registered to Rebecca Ingram, managing partner of The Hangar, a car collector’s storage facility in Santa Barbara, and operations manager for Eastern Real Estate. Brian Kelly, a well-known South Coast real estate investor owns The Hangar and is the co-founder of Eastern Real Estate. When reached for comment on the sales, Ingram declined to comment on the recent transaction or past deals. Included in the previous six deals off-loaded by Carrillo Holdings are the Union Bank building in Montecito for $16 million, the Sonos corporate R&D headquarters at 25 E. Mason St. for roughly $19 million, and a project on Anacapa Street in the Funk Zone for $12 million, according to Savills Studley. The Business Times previously reported that Kelly snapped up the Sonos property for $9 million in 2012 under East Mason SB LLC. New Group-Santa Barbara is registered to Charals Haagen, son of the late shopping center tycoon Alexander Haagen. The elder Haagen died in 2011 and was famous for his involvement in the Coliseum-Irwindale controversy, the result of a dispute with former Los Angeles Raiders owner Al Davis. “This opportunity met all of the buyer’s investment criteria, including the property’s location in a coastal, high-barrier-to-entry trade area, its high visibility within the sub market, and the stability of the asset,” Savills Studley’s Bauman said in the release.